My Ravelympics Shawl is done! Woo hoo! Now back to work. I need to do a few more things to get patterns ready to be released. And I’m working on new swatches and things. Last night around 11:30pm I finished the body of the shawl. Whew. All that’s left to do now is the edging. I’m going to do that this morning and then set it to blocking. Wanna see a picture? Of course you do! I know it looks kinda blobby right now, but once it’s blocked it will be stunning. Once I finish this, then I will get to work on releasing some patterns. I have two that are ready (or close to ready, one needs a new picture) to be released. So hopefully those will go up today. I will post here when they’re ready. Friday night started the winter version of Ravelympics. I know I hadn’t mentioned it on here, but I am participating again this year. I’m a proud member of Team Flaming Hooks (a Crochet Liberation Front Ravelympics team). This time I’m competing in the Short Track Shawls event with the Beaded Thistle Shawl by Mary Beth Temple. It’s a stunning shawl done in Swiss Mohair by Universal Yarn. And it has pretty beads on it. I’ll post again tomorrow with progress from today. I’m working a half day tomorrow since it’s a holiday here (and John’s home from work) so if I don’t finish it today, I hope to get it done by tomorrow. * Yes, I know, the cats and the dog don’t have access to a bank account or the internet, but work with me here. In other news, the package I sent to the yarn company arrived there today and my contact liked it and we talked about my next project. Which will soon be on its way. 🙂 Yay! 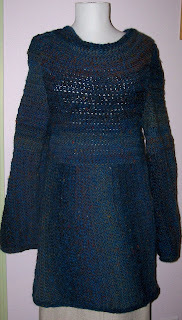 Also today I wove in all the ends on SSP#2 and did the final blocking. It’s currently in the other room, and will be packaged tomorrow morning to be sent off. 🙂 Woo! So I went back to the station today to have lunch with Bossman (well, former Bossman). It was nice to go and have lunch and chit chat and catch up. After lunch I wandered around the station visiting with people. I got to show off the magazine (you bet I took it with me) and talk about living my dream. 🙂 It was a good trip. Even if it did take up the whole afternoon. I had contemplated working on editing SSP#2’s pattern tonight but I really would rather do it when I’m clear headed tomorrow morning. I think now I’m going to work some more on the Seraphina Shawl. No, there won’t be a pic of me in it until January. It’s already 83 degrees outside and it’s only 9:15am. This sweater is very very very warm. I’m pleased it’s done. Now I can get back to focusing on SSP#2. Which, as of last night, was completely together and one side of the edging is completely done. All four rows. So, here’s the thing. I was playing around with the edging and couldn’t decide what I wanted to do and how it would look. Rather than going all the way around and then end up ripping something out, I decided to join each of the colors and kinda work them at the same time (no, this isn’t what I expect the crocheter to do…it’s just faster for me). Basically I work part of the way in the first row, then go back and pick up the loop for the second row, work up to just before the end of the first row, and repeat for all 4 colors. 🙂 Since I’m working this with it laying out on the dining room table, this seems to be the most efficient way to do it. I think I should be able to be done today. Then tomorrow will be the final weaving in of ends and one final blocking. Then Monday will be the final tweaking of the pattern and ship on Tuesday. Whew. Well, time for coffee and to start housework before I work on SSP#2. My lunch appointment yesterday got rescheduled for Monday. Yeah, I don’t miss that job at all……the lunch is with my former boss so we can catch up (we were great friends while I worked with him) and he got slammed with stuff yesterday and couldn’t break away. The next day our schedules work together is Monday. So we’ll see. All the ends are woven in on the yarn company project, and all it needs now is a quick light blocking and then packaged to go. I’m waiting for a return email from my contact there so I send it to the right place. I have 2 back to back lessons today at the shop. I’ve got the lesson plans typed up and all that and ready to go. I need to crochet up a few samples for the first lesson before I leave. But…great news….I just got word that another design has been accepted! They’re figuring out the yarn and all that now and I should hear something more soon. 🙂 This is an awesome feeling. I wonder if the excitement goes away after a while. ‘Cause right now every single design that is accepted makes me happy and giddy. Tonight I’m hoping to finish up my sweater for Ravelympics. Last night I was able to get the second sleeve sewn in and started weaving in ends. I only have to finish the neck edging and then weave in a few more ends. It could very well get finished tonight! Anyway, I need to go finish up my work. Our skies still look like a storm is here. It rained last night and looks like it might rain today but I don’t know if it will. Almost done. I have 1 sleeve left to set in. And then back neck trim and weaving in a gajilion ends. It’s just so warm that working on it is difficult. I have to sit under a bright light in the dining room and can get about 3 stitches made before I have to stop and take a break. I tried it on and this will definitely be a warm sweater. I’ll get to wear it on the one day it gets really cold and only if I stay outside the whole time. Or if we ever go up north in the winter I will be set. Anyway, here’s the picture of it almost together. This was taken with the flash, so the color is a bit off. Okay, I need to get to work. I’m hoping to finish the sweater tonight after work. So thankfully Margarita was over to crochet and watch Gilmore Girls on DVD. She talked me down from throwing it across the room (this is my most used method of dealing with stress…crochet, sewing, cross stitch….these things have all at some point flown across a room). I walked out to the garage to visit with John and calm down before coming back in to just start the second sleeve. I got the second sleeve done and then went back to fix the problem in the first sleeve. I finished that at 11pm last night. Too tired to try to do assembly. This morning I got up and did the sleeve trim and seam on one sleeve. Then it was time to get to work so it all got put back into the bag and will be worked on later today….after I finish my work. All I have left to do is to trim the hem edge, trim the second sleeve, sew up the sleeve seam, the side seam, the two shoulder seams, and then set the sleeves in (my least favorite part). Then I have a bit of neck trim and tacking down the collar. Then comes my most least favorite part of weaving in the ends. I typically do so well when I’m working on work stuff, but personal stuff I always end up waiting to the end. I’m hoping to get done with work stuff by 5pm so I can have plenty of time to work on the sweater and hopefully finish tonight. Speaking of, I finished my work on SSP#2 for this morning so I now need to get part one of six of my yarn company project done. Happy Monday! Day two concluded with the entire body of the sweater being done. Even with being gone for a few hours. I got up yesterday morning and started right on the sweater. I finished the skirt just before I left to go to lunch. 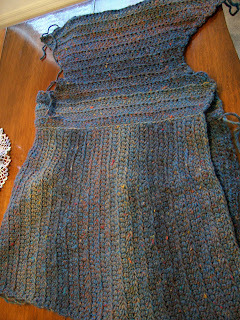 When I returned I did the “evenly space 96 slip stitches” along the top of the skirt. Then it was time to start the body and get the back done. By 7pm I was finished with the back. I then moved to the front and finished it by 10pm last night. We did have a case of attempted sabotage because a certain black and white kitty here decided that she wanted to steal my bamboo hook while I was out talking to John. I came back in and found the sweater had been knocked over. I thought for a minute that perhaps it was from placing it wrong on the sofa. Then I realized I couldn’t find my hook. Katrinka ran from the hallway to under the coffee table when I walked in. I decided to go see if maybe she had stolen the hook. And she had. Little brat was sitting there “guarding” the bamboo hook. So I chased her around the house for a good 10 minutes. She hissed at me, I hissed back at her, it was a good time. 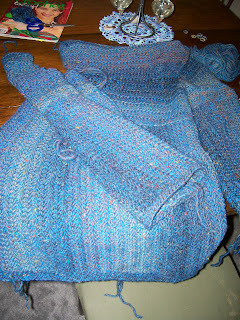 It didn’t deter me, and like I said, I was able to finish the body of the sweater. I’m slightly freaking out because it doesn’t look like it’s going to fit. But, I haven’t started seaming yet, and from what I can tell, the body isn’t seamed together at front and back. The sleeves get set in and that seems like it will make it fit. And yes, I am dead on for gauge…even using the yarn called for…and I’m making a larger size than needed so it will be looser fit. We’ll see. I’m going to follow my advice I give everyone else and trust the pattern. Today’s plan is to hopefully cross the finish line. I have sleeves and assembly to do today. So far there are two people who have crossed the finish line in Sweater Sprint. BUT….they’ve been making shrugs. I’m still hoping I can be the first full sweater to cross.